Here's the vote tally for yesterday's South Carolina Democratic primary. Here's the map of counties. While Hillary and Edwards only won one county each, in several counties, their combined totals exceeded Obama's. Among them: Anderson, Chesterfield, Cherokee, Lancaster, Lexington, Newberry, Pickens, Spartanburg and York. Hillary drew more votes than Obama in Oconee County, which was won by Edwards. She talks about "Fighting for a new future for America." 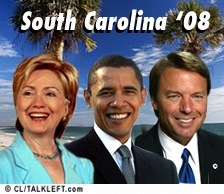 She congratulates Obama and thanks the people of South Carolina. After that, she says now the eyes of the country turn to Tennessee and the Feb. 5 states...including Florida. She says the crowd is bigger than they anticipated. She wants to continue the conversation she started a year ago. She wants the election to be about the next generation and the young people. Her voice drops, she's really hoarse. She's speaking very conversationally, CNN cuts her off, saying she's into her "stump speech" and says you can finish watching her on cnn's website. Edwards is on now. He joins the Clintons in congratulating Barack Obama. Now "the three of us move on" to February 5th. He's in. Good for him. He's working really hard and he's got important things to say. Poverty, health care, veterans, the middle class, the homeless, people who want to go to college, "your voice will be heard in this campaign." That is so much more reassuring to me than hope and change. He ends with, if you haven't yet voted on Feb. 5, "your voice will be heard and we will be there with you." Update: Text of Edwards speech is here. Showing a little more class than Obama last week when he lost Nevada, Hillary Clinton released a statement saying she called Obama to congratulate him. "I have called Senator Obama to congratulate him and wish him well. "Thank you to the people of South Carolina who voted today and welcomed me into their homes over the last year. Your stories will stay with me well beyond this campaign and I am grateful for the support so many of you gave to me. "We now turn our attention to the millions of Americans who will make their voices heard in Florida and the twenty-two states as well as American Samoa who will vote on February 5th. "In the days ahead, I’ll work to give voice to those who are working harder than ever to be heard. For those who have lost their job or their home or their health care, I will focus on the solutions needed to move this country forward. That’s what this election is about. It’s about our country, our hopes and dreams. Our families and our future." Hillary says it's on to Florida and the Feb. 5 states. Keep in mind, Florida is different than Michigan because all three candidates are on the ballots, regardless of whether their delegates get seated or not. Bill Clinton is speaking now in Missouri and also congratulates Obama. He says Obama won fair and square but now it's on to the states with the big numbers. Beginning now, Big Tent Democrat and I are live-blogging the South Carolina Primary results and the media coverage of them. I'll be concentrating on the results and the demographics and electoral storylines. Big Tent will focus on the media coverage. We're using a new platform, I described it here, and to make it wider, I've put it below the fold. Just click on the "there's more" link and join us. If you want to come back to it, here's the permalink for you to bookmark. Roughly half the voters said former President Clinton's campaigning for his wife was very important to their choice. More exit poll results here. Big Tent Democrat and I are going to try something new tonight. We have new software for live-blogging. It's much faster and we can do it together without fear of erasing the other's comments. Readers can also submit comments to us while we're live-blogging and we can include some in the live-blog. You can also comment as usual in the comments. When we go live, at 6:30 pm ET, you may want to bookmark the permalink (the link that says "there's more...permalink...comment" )because the live blog will appear in the "more" section so that it can be wider than the front page allows. This is just a reminder thread. It's an experiment, we'll see how it goes! Tips for readers are below. (Link here if you want to know more.). The stakes are high for the candidate who can mobilize the 612,000 eligible South Carolina voters younger than 29. Last Saturday's GOP primary drew 44,000 young voters, according to exit polls. That was only 10 percent of the total turnout of 443,000. In contrast, 35 percent of the Republican voters last Saturday were over age 60. That trend relegated Mike Huckabee, who blitzed college campuses last week, to second place behind John McCain, who won with older voters. According to the Secretary of State, there are 2,246,242 registered voters in South Carolina in 2,048 precincts. In the 18 to 24 age group, there are 216,877 voters -- in the 25 to 45 age group, there are 738,704 voters. These numbers include Democrats, Republicans and Independents. So, there are almost a million voters under age 45. By contrast, there are more than 1.5 million registered voters over age 45. In the 2004 presidential primary, 184,288 voted in the Democratic primary. 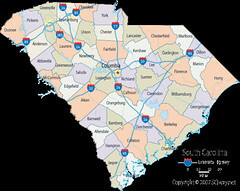 WSJ: Obama Needs Double-Digit Win in S.C. But with expectations set so high, political pundits say the Illinois senator faces a dilemma: He will have to win by a double-digit margin in order for voters nationwide to perceive South Carolina as a real victory. Up for grabs for S.C. Dems today: 54 delegates, including 45 committed and 9 super delegates. African-American: "Big turnouts in counties like Richland, Charleston and Orangeburg counties could indicate strong support for Obama." Women: "Reports of heavy turnout in Greenville or Horry counties could indicate hope for Clinton." Youth vote: "Heavy turnout in wards adjacent to Clemson University, USC and Benedict College could point toward votes for Obama." Independents: Watch the exit polling. A high turnout of Independents is expected to help Obama and the Democrats. A post-debate South Carolina Reuters-Zogby poll was released today. Obama is still ahead, but his lead has narrowed and Edwards has gained. Obama's lead fell 3 points overnight to give him a 39 percent to 24 percent edge over Clinton in South Carolina, according to a Reuters/C-SPAN/Zogby poll released on Thursday. Edwards, a former senator from neighboring North Carolina, climbed four points to reach 19 percent -- within striking distance of Clinton and second place. Edwards held a slight lead over Clinton among likely white voters at 35 percent to 32 percent. Obama had 19 percent. There was only one reference to criminal justice issues in the South Carolina debate. It had Obama and Hillary in agreement. John Edwards didn't weigh in on it, but he would agree as well. It's over. Who did the best? Who fumbled? Does it matter? I thought Edwards and Hillary did the best. I thought it was one of Barack Obama's worst debate performances, from his launching attacks on Hillary (transcript here)to his stuttering and his hostile, dismissive yet arrogant demeanor. I could say a lot more, but I won't for now. The winner tonight: John Edwards. I hope it gets him some votes, although even if it does, it won't be enough. I give the runners-up to Hillary because she was in greater control, speaks better and more knowledgeably and Obama seemed a little green behind the ears. His heart's in the right place but he's just not ready, in my opinion. Universal health care is a core Democratic value. 17 seconds of the debate well worth watching.